The Fukushima event is slowly building to become the most significant event in the history of nuclear power. I will continue to update this page to cover all aspects of this event and also to relate this event to US reactors. Please stop back when you can. IAEA provided a major update on the Fukushima reactors. April 11 update: According to MSNBC, the Japanese government's nuclear safety agency raised the crisis level of the Fukushima Dai-ichi power plant accident from 5 to 7, the worst on the international scale and on par with the Chernobyl accident 25 years ago. Japan earthquake One month on, Japan rattled by big aftershock Somber ceremonies mark a month since tsunami Japan to stop pumping radioactive water into sea NYT: Nuclear disaster reveals Japan temps' plight Millions of yen turned in, Japanese police say Aftershock in Japan unnerves traumatized nation Time-lapse of aftershocks Images of chaos, destruction Kyodo news agency said the government's Nuclear Safety Commission has estimated the amount of radioactive material released from the reactors in Fukushima, northern Japan, reached a maximum of 10,000 terabequerels per hour at one point for several hours, which would classify the incident as a major accident according to the INES scale. An earthquake of magnitude 9 occurred at 2:46 PM on March 11, 2011 about 80 miles out in the Pacific Ocean east of Sendai, Japan. That earthquake resulted in a tsunami over 40 feet high which hit the Fukushima Daiichi plant. Units 1, 2 and 3 were operating. Units 4, 5 and 6 were shutdown. 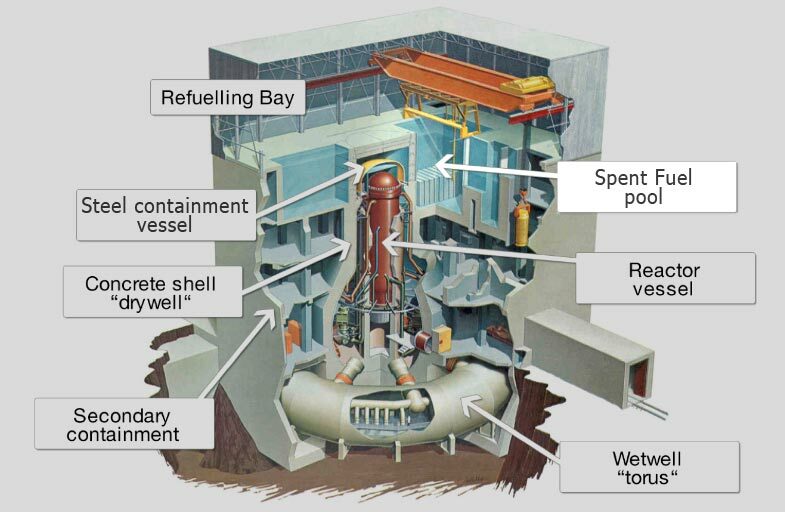 All of Unit 4's reactor fuel load had been placed in the Unit 4 spent fuel pool. Subsequent to the original earthquake, numerous additional quakes have occurred. The plant's diesel generators started when the loss of offsite power (LOOP) occurred. About an hour later, the diesel generators became unavailable. LOOP events are very infrequent but can have high safety significance. In this case, the diesel generators could not be easily restored. Such an event is considered a Station Blackout. US plant procedures usually consider such an event would likely last up to 8 hours. As a result, the decay heat in the recently shutdown reactors 1, 2 and 3 and the Unit 4 spent fuel pool, which contained the recently discharged full core offload of spent fuel, caused the cooling system temperatures to rise. Eventually the temperatures rose to the point that increased water evaporation or boiling occurred. Eventually the spent fuel was uncovered and the fuel temperatures rose because water flow was not removing the heat. Eventually, fission product gases passed through the zircaloy cladding. Temperatures above 2200F are considered undesireable. Eventually, the steam interacted with the zircaloy to produce hydrogen gas. Water/steam mixtures (with gases) passed from the reactor through pressure relief valves to the torus (also called suppression pool) which contains water. Fission product gases and hydrogen built up in the drywell. In turn, the pressure buildup in the drywell resulted in the operators determining the need to reduce pressure. When that was done, hydrogen was released to the Reactor Building where a hydrogen explosion occurred. An excellent seminar presentation, Nuclear Crisis in Japan , provided by Dr. Alan Hanson on March 21 at the Stanford University's Freeman Spogli Institute for International Studies presented an analysis based on information received to date. This nuclear plant was designed in the 1960s. While earthquakes and tsunamis were considered in the design, events of this magnitude were not considered. Credible information about the Fukushima event may be obtained from the following websites. There are 6 reactors at the Fukushima Daiichi site: Unit 1 is a BWR-3, Units 2 through 5 are BWR-4s, and Unit 6 is a BWR-5. BWR is the abbreviation for the Boiling Water Reactor. The BWR reactor typically allows bulk boiling of the water in the reactor. The operating temperature of the reactor is approximately 570F producing steam at a pressure of about 1000 pounds per square inch. Current BWR reactors have electrical outputs of 570 to 1300 MWe and are about 33% efficient. The NRC has provided a good BWR System text on their website. See the page Inside the BWR which illustrates the equipment used. In the US, radiation exposure due to this event should be of little concern. Radiation levels are rarely above background. Radionuclide deposition is being monitored by the Department of Energy and Environmental Protection Agencies, as well as various state agencies, e.g. Washington, Oregon, and California. Data from governmental agencies has been limited. One example of DOE data is provided in a 2010 PowerPoint presentation (Original DOE - Converted to HTML). However, the University of Washington Physics department and University of California Nuclear Engineering department have both been monitoring airborne and liquid concentrations and posting them. The figure below shows US radiation exposure regulatory limits and typical US radiation exposures. Appendix B, Annual Limits on Intake (ALIs) and Derived Air Concentrations (DACs) of Radionuclides for Occupational Exposure; Effluent Concentrations; Concentrations for Release to Sewerage, of Title 10 Code of Federal Regulations Part 20 (10CFR20), Standards for Protection against Radiation, identifies the regulatory limits for all radionuclides for workers and the public. Concentration limits in air and water for releases from nuclear power plants are presented in Table 2. As an example, click for I-131 and Cs-137 limits. To relate these limits to the data you may see in the news, 1E-10 microcuries per milliliter (mci/ml) is the same as 100 picocuries per ml (pci/ml) or 3.7 Becquerel/ml or 3.7E-3 Becquerel/m3). Radiation Dose Equivalent, SI unit is the Sievert where 1 Sievert is the absorbed dose in grays multiplied by the Quality Factor for the type of radiation (QF = 1 for X-Rays, Gamma, or Beta Radiation; 20 for Alpha particles, multiple-charged particles, fission fragments, and heavy particles of unknown energy; 10 for neutrons of unknown energy and high-energy protons; 2 to 11 for monoenergetic neutrons per Table 1004(b).2 of 10CFR20. Radioactivity, SI unit is the Becquerel (Bq) where 1 Bq is equal to 1 disintegration per minute. The US nuclear industry typically uses the original units not SI units. Radiation Absorbed Dose unit is the Rad where 100 Rads are equal to 1 Gray. Radiation Dose Equivalent unit is the Rem where 100 Rem are equal to 1 Sievert. Radioactivity unit is the Curie where 1 Curie is equal to 3.7 E10 disintegrations per second or 3.7E10 Becquerels (Bq). Copyright © 1996-2011. The Virtual Nuclear Tourist. All rights reserved. Revised: Wednesday May 18, 2011.